(Phys.org)—One of the most promising microscale power sources for portable and wearable electronics is a micro-supercapacitor—they can be made thin, lightweight, highly flexible, and with a high power density. Normally, however, manufacturing these devices involves complicated techniques that often require high pressures, irradiation, and multiple steps. In a new study, researchers have developed a simple "one-step method" for fabricating micro-supercapacitors and demonstrate that the final devices exhibit a very good overall performance, including a high power density (1500 mW/cm3) as well as an energy density (11.6 mWh/cm3) that is at least twice as high as similar micro-supercapacitors. The researchers, Han Xiao et al. at the Chinese Academy of Sciences, have published their paper in a recent issue of ACS Nano. "We have developed a versatile, simple and effective method for fabricating high-energy micro-supercapacitors with designed shapes," coauthor Zhong-Shuai Wu at the Dalian National Laboratory for Clean Energy, Chinese Academy of Sciences, told Phys.org. The essential step of fabricating the new micro-supercapacitor is integrating phosphorene nanosheets into the interlayer of graphene nanosheets, and the good performance is in large part due to the synergistic combination of these two materials. The different materials have complementary effects, with the phosphorene offering a high storage capacity and preventing the graphene sheets from unwanted stacking, while the graphene forms the main skeleton and offers a high-speed electron transport network. 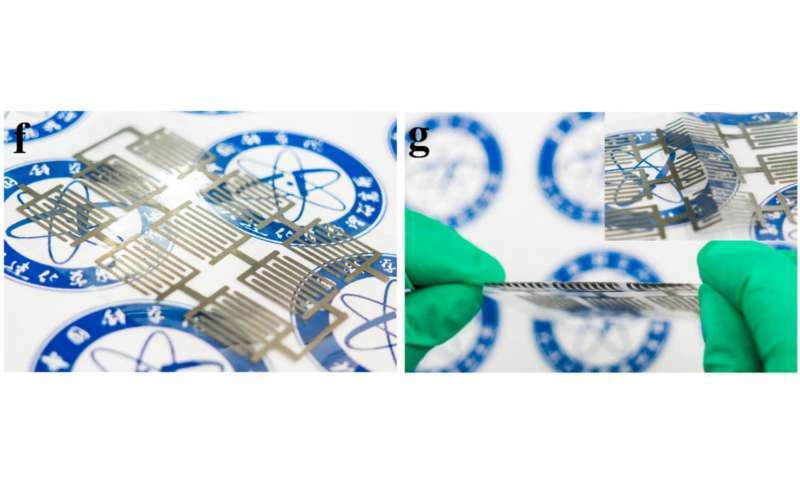 Among their other characteristics, the micro-supercapacitors demonstrate very good flexibility, which the researchers attribute to the layered structure and planar device geometry. The device also has a high capacitance, which is maintained at nearly 90% of its maximum capacity after 2000 cycles. In general, the simple fabrication process also contributes to improving the device performance because it avoids the contamination and oxidation that often occur during multiple-step processing. As the researchers explain, the small energy-storage devices have the potential to be used in a wide variety of areas. "Micro-supercapacitors are very promising for on-chip energy storage," Wu said. "Very recently, the emergence of wearable and smart electronics urgently call for highly flexible and multi-functional, integrated energy storage devices. Overall, new micro-supercapacitors could keep up with the pace of the fast development of high-tech microsystems used in the precision instruments, materials, bio-medical and other fields." The researchers also expect that, in the future, the new fabrication process can be easily scaled up and eventually be used for commercial purposes. They also plan to investigate other materials and techniques for developing microscale energy storage systems. "We are continuously developing a variety of ultrathin, structurally defined graphene and 2-D materials, safe high-voltage electrolytes, and device fabrication techniques for flexible, smart, and integrated microscale energy storage device systems, such as high-energy micro-supercapacitors," Wu said. Once again, incremental advancements done by anonymous research individuals like this, are pivotal to the advancement of us all. What is anonymous about the Dailan institute? It's been around for over 50 years. What about the individuals doing the actual research? Johnny Smith was killed today when his iPhone's supercapacitor short-circuited in the rain. UCLA did this 10 years ago. They printed graphene supercapcitors on a CD substrate using a LightScribe burner. No idea why anyone thinks this is innovative or even important? Clicking on the individual names it seems only two of them are PhD students. The rest already seem to have quite a track record judging from the number of publications (in some cases already more than a hundred). At least those are certainly not obscure individuals in the respective community. The article is about super capacitors, which do not operate in the kHz range. It has no meaning to discuss it - this technology will never appear at the market. Did someone see the LightScribe capacitors hyped before seven years? It's all nonsense - actually whole the supercapacitors are on decline. 1994: "Today Show": "What is the Internet, Anyway?" @antialias, seems to me that @Whyde's comment is best taken as a lauding of the small accomplishments in physics that lead up to large results, rather than as some sort of denigration as you allege. I think you should calm down. I think these small accomplishments are what science is really all about. It's nice that occasionally there is a revolution, but no real scientist expects to lead a revolution. They're just there to find out how things really work by checking it for themselves. And I think that's what @Whyde was talking about. I get that. (As he's posted similar comments elsewhere). Just niggeling on the 'anonymous' (no offense intended). See, the research community in hyper-specialized areas (and which area of research isn't?) is very small. E.g. I kept seeing the same 300 people at conferences - wherever in the world they were held. People get to know one another (usually at the conference dinners or at some other social event over the course of the 3-5 days). But the - to me - important part is: when you look through the conference programme and decide which of the multiple, parallel sessions to attend in each timeslot you don't go by 'who you know'. You go by what's the most interesting paper for you. You can't really make a name for yourself because no one cares about your name - they care about the work. But that doesn't mean you're anonymous.